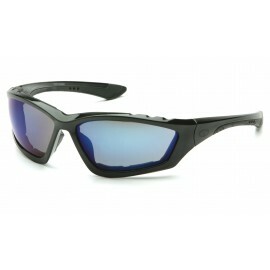 No other safety glasses offer the protection and durability than the Pyramex V2-Metal Safety Glasses. These protective eye glasses have the same great look at the Venture II glasses, but come with metal frame that is built to last. V2-Metal safety glasses also come loaded with ANSI Z87.1-2003 High Impact Requirements lenses made from a scratch-resistant polycarbonate, ideal for work environments that require protective eyewear. Don't worry about wearing these glasses for an extended period of time, they come with spring loaded temples that adjust to your head shape and the rubber nose pieces let these sit comfortably on your face. Pyramex V2-Metal glasses are ideal for all types of industries, including manufacturing, construction, engineering and agriculture. These eyeglasses are also popular among outdoor enthusiasts while mountain biking, rock climbing, river rafting, skiing, snowboarding and more.